Victoria Bitter and the NRL have launched the Hardest Working short video series, which sees NRL stars Nathan Brown and Iosia Soliola surprise two hard-working NRL fans who have hit tough times. The two-part series has just been released on NRL.com. 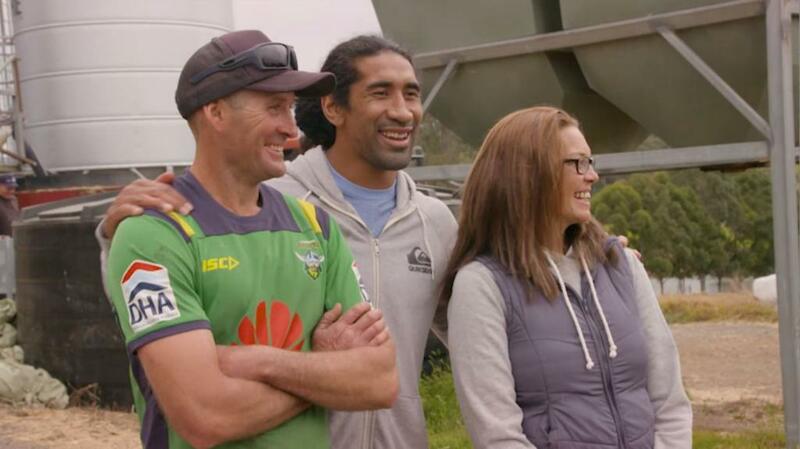 It features the players helping an RAAF veteran and two struggling farmers. Newcastle RAAF veteran Chris Harris and Bega Valley farmers Brett and Anne Jessop feature in the series. They were visited by Brown and Soliola on behalf Victoria Bitter in the lead up to the NRL Grand Final and each rewarded for being among Australia’s hardest-working NRL fans. Victoria Bitter’s involvement in the series is the evolution of the VB Hard Earned Award, which recognised the hardest working players throughout the 2018 NRL season. Former RAAF serviceman, Chris Harris and his partner Sharlene moved to Newcastle following the birth of their third child. RSL DefenceCare has been providing support to Chris and his family. Chris is determined to repay this money, even though it is not expected. Victoria Bitter, recognising the burden on this young family, decided to repay the funds on Chris’ behalf so that he could concentrate on what is most important to him: being a dad. Nathan Brown, one of the hardest working players from the Parramatta Eels, was keen to help. Brett Jessop and his wife Anne are farmers from the Bega Valley in southern NSW. They, like many hard-working Australians, are currently battling the drought. Brett is a keen Canberra Raiders fan. Victoria Bitter reached out to the Raiders’ spiritual leader, Iosia Soliola, to surprise Brett and Anne with a desperately needed delivery of feed for their cattle. Victoria Bitter and the NRL will host the Jessops and Chris Harris and Sharlene at this weekend’s NRL Grand Final between the Melbourne Storm and Sydney Roosters.